The network of six trails, 1.45 miles, through vegetative types ranging from meadow to mature forest, are anchored by an eighteenth century farmhouse, a stop on the Cooper River Historic Trail. The nature trail borders a lake. From NJ Route 70 in Cherry Hill, NJ, take NJ State Road 154, known as Brace Road, two lights to Borton Mill Road, turn right. Park in the first large parking lot on the left. The main trail head is located at this parking lot. The main trail head for the nature trail can be accessed from this parking lot by following the signs. Croft Farm Trails are an interconnected system of trails totaling 1.45 miles located on a National Register of Historic Places designated eighteenth century farmstead that is now Cherry Hill Township Open Space land. Habitat management techniques were used to help create some lengths of trail. A large border of land along the Borton Mill and Brace Roads were regularly mowed. The Cherry Hill Environmental Advisory Committee worked with the Mayor's Office, Recreation Department and the Department of Public Works (DPW) to reduce mowing in these areas. The technique promoted the development of meadow habitat along two Open Space borders. By mowing along the wooded edge a trail was created taking trail users along meadow and early successional forest borders. Edges are good places to view birds and other wildlife. The creation of this trail along the edge allowed a linkage with a Cherry Hill trail system located across Brace Road, State Route 154. This trail system, called Borton Mill Trails are largely in place, but still under development. Of the six trails, one is designated as the Croft Farm Nature Trail. Winding through mature forest and bordering Evans Pond, it features ten stops marked by wooden posts and brown aluminum signs showing a nature sticker and numbers one through 10. Below the line stickers show the following symbols, a nature trail, no motorized bikes, no ATVs, a hiker, and a directional arrow. 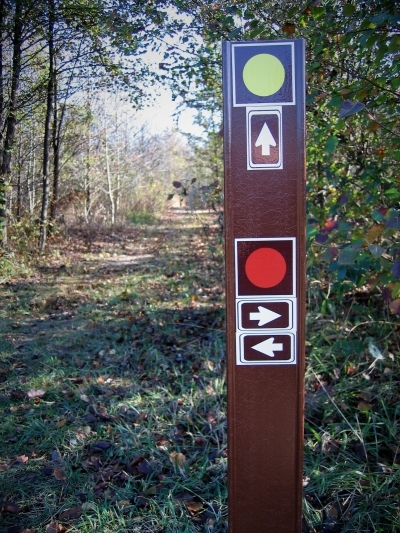 A solid metal trail guide box is mounted on a post next to the nature trail head sign post. The nature trail guide interactively discusses soil, vegetation, trees, wildlife, wetlands, birds, decomposition, habitat, and biodiversity in a question and answer format. The answers are provided to promote use by families to better connect with nature. The last nature trail pamphlet entry challenges trail users to help improve the environment. The trail guide boxes are installed at each end of the trail so trail users can use the environmental education tool regardless of which end of the trail they enter first. The trail guide is attached to this application. A highlighted section on the trail guide's last page asks nature trail guide users to deposit the guide in the box at the end of the trail so others can reuse it. This was designed to extend the life of the trail guides and reduce the need to restock nature trail guides. Croft Farm Trails provides the opportunity for community public service. Two Boy Scouts of America Eagle Scout candidates completed their Eagle Scout Project while improving the trails at this location. One project provided and installed all the posts for the Croft Farm Nature Trail. The second project erected a bridge over a stream that drains a wooded wetland on the property and feeds into Evans Pond. Cherry Hill Township's Cherry Hill Environmental Advisory Committee coordinates the township's activities for National Public Lands Day (NPLD). Croft Farm Trails was the location for public service in 2009 and 2010. Trail sign posts were installed, trails were widened, and woodchips were added to new trail entrances during the 2009 NPLD event. The installation of a rain garden on Croft Farm to help reduce stormwater runoff and associated erosion into the stream that flows under the new bridge and into Evans Pond discussed earlier, were activities scheduled for 2010 NPLD. Trail maintenance is performed by with a mix of Cherry Hill DPW, CHEAC, and others volunteers. DPW performs all the mowing. CHEAC keeps track of trail maintenance needs, installs signage, coordinates volunteers with the Cherry Hill Department of Recreation. Croft Trail promotion is accomplished with CHEAC taking the lead in product development. After review and approval by the Recreation Department and Mayor's Office, the trail layout, description, location, and key features are posted on the Cherry Hill website. 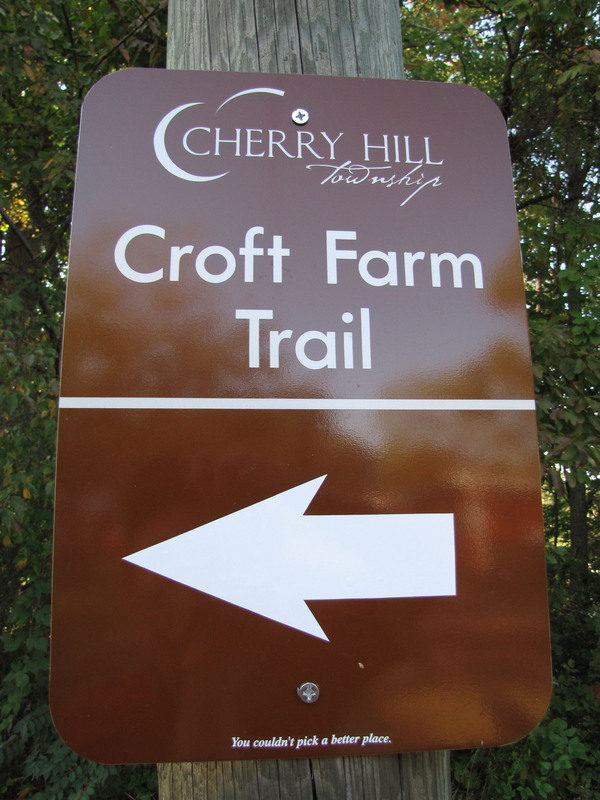 CHEAC promotes trails at community events including the Cherry Hill Fall Festival at Croft Farm and the Cherry Hill Earth Day celebration at Croft Farm. Croft Farm Trails and other Cherry Hill trails are promoted at these events to connect people with nature, increase support for Open Space lands, and to highlight outdoor recreational opportunities in the community. History of Croft Farm: Once a working mill and farm and a stop on the Underground Railroad, today Croft Farm is a vibrant Arts Center and public open space site. The Croft site has played an important role in the growth of Southern New Jersey for more than 300 years. It is on both the New Jersey and National Register of Historic Places. From 1697-1897, four different mills earned the Kay and Evans families their livelihood. People and supplies traveled along Cooper Creek to Croft Farm, then known by such names as the Free Lodge Mill, Springwell, and Edgewater. The centerpiece of Croft Farm is the 16-room farmhouse. Built in several stages, the original section of the house was erected in 1753 by Issac Kay and exists today as the dining room. British troop marched by the house as they departed Philadelphia in 1778 for New York City. The Continental Army under General George Washington intercepted them precipitating the battle of Monmouth. It was reported by a descendent of Thomas Evans that Croft Farm "was one of the stations to which runaway slaves were brought. The slaves came from Woodbury and were received by Thomas Evans, then quickly hidden in the attic of the house so that no one could find them. Then, in the middle of the night, they would be given something to eat and hurried off in a covered wagon to Mount Holly, where they were received and hidden again." No one knows for sure how many people on the Underground Railroad were housed and fed at Croft Farm. Records show that Josiah Evans arranged to purchase the freedom of two fugitive slaves, Joshua Sadler and Jefferson Fisher, rather than have them picked up by a bounty hunter. They remained at the mill, working to repay Evans for his kindness. Sadler went on to become the leader of a small settlement of freed slaves who established "Sadlertown" in what is now Haddon Township. In the 1920s, with the once flourishing saw and grist mills no longer functioning, the Evans family sold the land to John W. Croft, Jr. who, along with assistant Thomas McCargo, farmed the land until 1981. In 1985, the Crofts sold the 80-acre property to Cherry Hill Township. In 1995, a new era began as the Cherry Hill Arts Center was dedicated on the grounds of Croft Farm. Croft Farm Trails were completed in 2010. 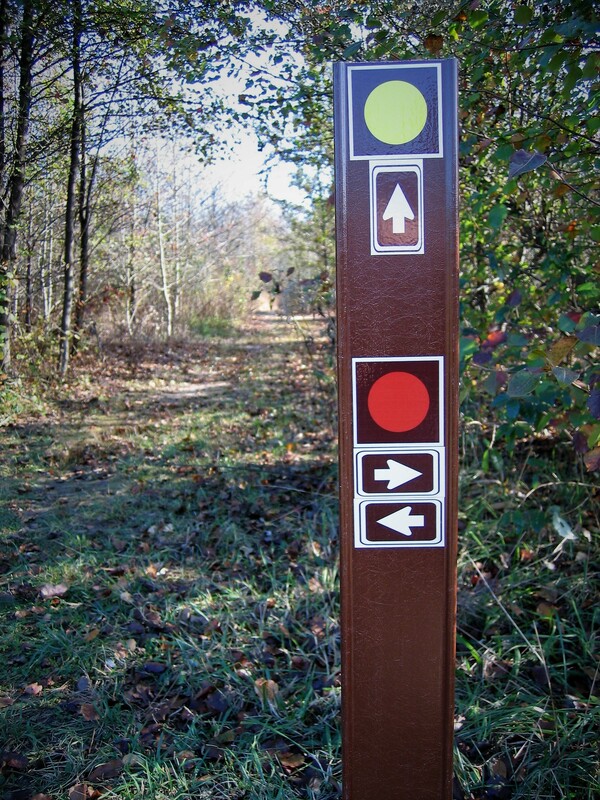 All trail intersections are marked and correspond to the trail map shown on kiosks at 2 main trailheads, and on the CH website. Photo by Lew Gorman III. Eagle Scout project added a need bridge over an intermittent stream along the Croft Nature Trail. Photo by Lew Gorman III.